GV-VS11 is a powerful H.264 Video Server with compact size and supports dual streams and multiple applications. It supports 1-channel full D1 real-time video and audio encoding, fully integrated with GV-NVR to form the most powerful IP surveillance solution. It also supports over 50 PTZ models to fulfill various project demands. It can record video to a local USB storage, forming the smallest video recorder. It can also active Tampering Alarm alerts when a tampering event happens to prevent crime events. The GV-VS11 does not support the PoE and GPS functions. The GV-VS11 does not support the USB2.0 to SATA / IDE cable for external USB storage connection. The GV-Video Server does not support Internet Explorer 10. The GV‐Video Server cannot work with the microphones that acquire power from the unit. Use microphones that have external power supply. 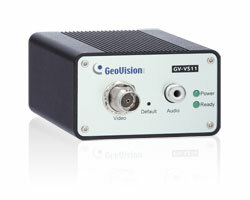 Optional devices can expand your GV-Video Server's capabilities and versatility. Contact your dealer for more information. GV-Relay V2 Working with the GV-Relay V2, the GV-Video Server is capable of driving the loads of relay outputs over 5 volts.